Compare Irons 2017 - What Makes the Best Buy Steam Iron? Our updated compare irons 2017 table lets you judge – at a glance the best buy irons. Based on our survey results, you'll find the users overall satisfaction ratings per model plus a run-down of the facts owners tell us are important – like how long the power cable is. 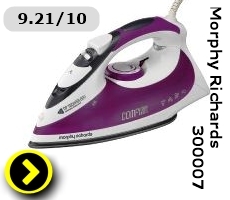 Check out the top steam irons – as voted by UK users - from Morphy Richards and Breville. Sadly, no Bosch, Rowenta or Russell Hobbs irons made it into the top ten this time. In our quest to find the UK’s best buy iron, we’ve now surveyed over three thousand user in order to build our compare irons table. 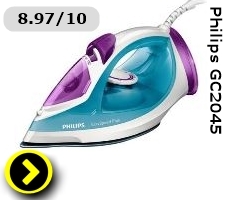 *Overall Users’ Satisfaction Rating for effective ironing, ease of use and value for money. Which steam iron can help you get through that ironing pile and deliver, neatly pressed results? Here are the top irons. What they give you is a lot of controlled steam. banish creases in one pass of a slippery iron sole-plate. ironing for before needing to top up the tank. All in all the best irons deliver you a shorter ironing chore. reasonably long continuous ironing time before the tank needs a refill. of mind of auto switch off and a long 3 year guarantee. 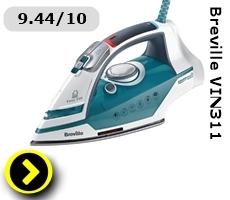 For our money, the best budget buy iron is the Breville VIN311 (User rating 9.44/10). 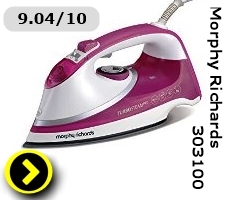 The Morphy Richards 300007 (User rating 9.21/10) is another budget best buy. 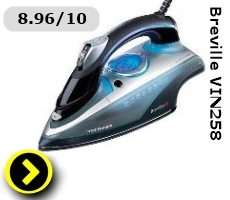 This steam irons offers 40g regular and a crease busting 160g of steam on demand. The key question we asked in our user survey was this: “You’ve been using your steam iron now for six or more weeks. Given your experience to date, how would you rate your iron overall on a scale of 1 (low) to 10 (high)? Think about ease of use, reliability and value for money”. Your best buy irons will have a score of 8 or more. A score of 7 suggests a good design marred by poor reliability. A score of less than 7 suggests a product has both design and reliability faults. It’s a waste of your money. A guide at the time of publishing. This steam iron copes well with the demands of a family ironing pile containing mixed fabric garments. This iron would serve single people and/or couples well. How heavy an iron feels will depend on how big its water tank is (water is heavy). The figures given here are before adding water. The more powerful the wattage, generally the more steam an iron can produce. You want a cable that’s around 2.5 to 3m in length – just right. An iron with 180* or 360* freedom will keep the cable in an arch shape so it doesn’t tangle in the garment or snag your arm. are claimed to reduce power consumption. puts an iron into hibernation if it’s left parked for a period of time – usually 20-30 minutes. All the iron sole-plates in the table have been enamelled with a non-stick ceramic coating. This resists scratches & brown residue. It makes the sole-plate easy to push over a garment. You want this function! It makes it easier to iron collars, round buttons or along fiddly pleats. A handy feature is you iron once a week and fabric is bone dry. The iron starts producing steam in response to you pushing it over a garment. Usually associated with the auto-off/hibernation function. The more g/min (grams per minute) the more steam is pushed into the fabric. Steam dampens and relaxes fabric making it easy for you to smooth away wrinkles and creases with one or two passes of the iron. Your best buy iron will have this function! It provides added wrinkle or crease busting power. It’s also great for putting creases into garments like trousers and for vertical steaming. This is the theoretical time before you have to refill the water reservoir. In practice you won’t be continuously ironing. You will also be adjusting garments on the ironing board, putting ironed clothes to air or sorting out the next item to iron. Said to make steam particles smaller so they penetrate fabric more effectively. Probably makes water wetter, too. 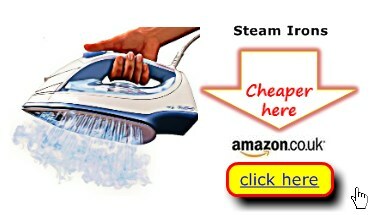 enables you to steam hanging garments – say a shirt or coat - and fixtures like curtains. These functions let you switch off the steam and avoid annoying drips at lower temperature ironing. It’s more convenient and probably cheaper than distilled water. Capacity measured in millilitres. The bigger the tank the longer the iron can produce steam before refilling. You hold the iron over the sink and press a button. The iron produces pulses of steam and water to flush the sole-plate of lime-scale particles. The iron contains a filter to neutralise lime-scale. That keeps the iron’s heater efficient and prevents the sole-plate steam holes from clogging. There’s a facility to tidy the cable to iron when not in use. You’ll compare irons because you want the best buy steam iron and that means both performance and price. We’ve done the research for you and found the top 10 steam irons in the UK right now. 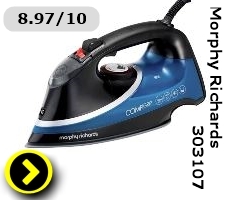 As you would expect these best buys for steam irons come from respected manufacturers like Morphy Richards & Philips. 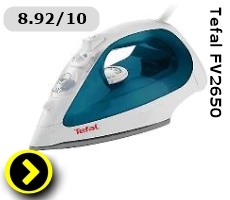 A couple of Tefal and Russell Hobbs irons almost made the top 10. Sadly no Rowenta steam irons did. But you don’t need to pay top whack for the best. For a 50% off bargain check out the relevant steam iron’s price search page to make great savings from anywhere in Britain. We can point you to the right solution to your ironing blues. Banish wrinkles and creases from any fabric at full steam, low temperature or dry iron settings. 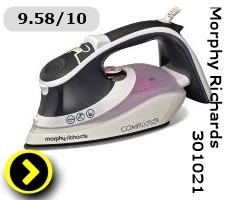 Use our clothes iron comparison table and then check out our price research pages. 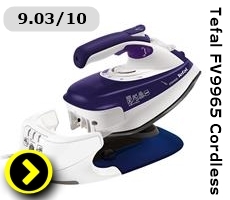 Grab yourself the best buy iron in the UK at a small price. That’s right, save money and save your time – over and over again. Thank you for using our UK compare irons table.